I’m excited about the new Windows Phone 7 device, especially developing for it. I’ve written two blogs posts about it as of this date (Filed here) and I plan on writing many more. I also plan on buying a Windows Phone 7 when it launches and getting as many apps as I can in the marketplace. are sure to be awesome. I’ve also added a small banner in my sidebar to stay up while the events are going off for two reasons. 1) There is a contest and 2) My hope is that a lot of developers will get excited and get tons of fantastic apps in the marketplace. Go download the tools and let’s make this platform great! In my last Windows Phone 7 blog entry, we took a look at making a very simple Windows Phone 7 application. This time around, our goal is to make an app that uses the microphone on the phone and reads and writes to the phone’s isolated storage. 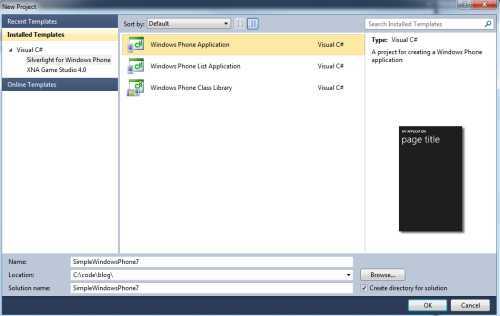 Let’s fire up Microsoft Visual Studio 2010 Express for Windows Phone and go File–>new Project–>Visual C#–>Silverlight for Windows Phone–>Windows Phone Application. Pick a Location for the Solution and name it SoundRecorder. The first thing we need to do after the project is created is to add a reference to Microsoft.Xna.Framework.dll. Right click on References in the Solution Explorer and select “Add Reference”. Find Microsoft.Xna.Framework.dll, select it, and click “Ok”. That will reference the Xna Framework (even though this is a Silverlight application) and give us easy access to the microphone. Now, let’s get our XAML set up. Type / copy-paste / set up the code you see below into MainPage.xaml. There isn’t much to see here besides three buttons (one of them disabled at the start) and our app’s title. Due to space constraints and the desire to be very “2.0”, I had to shorten the application name in the title to “Sound Recordr” from “Sound Recorder”. // delegate here if I had so desired. /// in the buffer array to the memory stream. /// Initializes a new memory stream for new playtime. Starts the mic. /// Stops the mic and writes out the file. /// Writes our the file, using isolated storage. /// its bytes to the playFile method. This code gives us a new Microsoft.Xna.Framework.Audio.Microphone object. We call for Microphone.Default and that gives us the default microphone on the system. The great thing about this is that on the phone is is the phone’s microphone, headset, etc, but in our simulator – your computer’s microphone is used. All of the other things that are done with this class are just the built-in XNA magic (documentation). After that, I basically use my variable userStore just like I would any other component in the System.IO namespace. 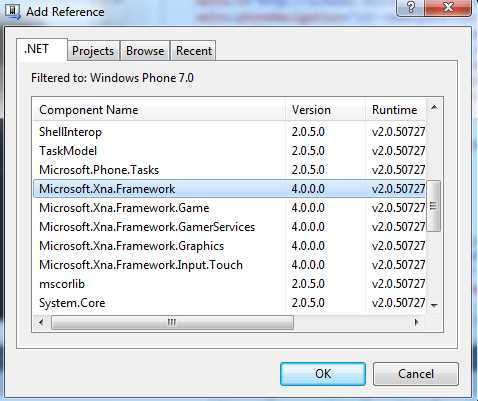 That is really the power of Windows Phone 7 development. All of this code should be very familiar to .Net developers and behaves just like the phone was a little computer (which of course it is). We cannot play the file yet because we haven’t recorded one. If we click “Start” and just talk or sing or make noise for the mic and then click “Stop”, we see that the “Play Existing File” button becomes activated. If you click “Play Existing File”, the file will be retrieved out of storage and played back with another excellent class from Microsoft.Xna.Framework.Audio, the SoundEffect class. This is definitely demo code (read: it has bugs), and is only guaranteed to work on my machine and with the April CTP bits that I have loaded. 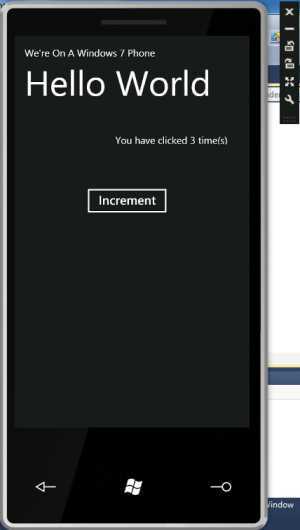 Disclaimers aside, this definitely shows that developing for Windows Phone 7 should be extremely easy for anyone who knows or can learn .Net. Certainly by now you have heard of the new Windows Phone 7 that is due out later this year. I’ve heard that it will be a game changer, that it is a culmination of all of the lessons learned from other WinMo phones, etc. I do admit that it does sound like they’ve learned some lessons and the designs of the phones I’ve seen demoed are all very nice with appealing UIs. The story for developers for Windows Phone 7 is a pretty good one. You have the option of either designing in Silverlight or using XNA, which is one way that you can make games for the Xbox 360. In both cases, there should be a good number of people with the skills to make phone applications already in the wings. And because it is Microsoft, you can expect that the tooling will be good (unlike another popular phone maker). To get started, you need to head over to the Windows Phone 7 Developer Center and download the tools. At the time that I’m writing this, the April CTP refresh is the most recent offering, but as this is still pre-release software, several things could still change. Follow the instructions for installation and we will be ready to go. The installer will install a version of Visual Studio Express specifically for developing for Windows Phone 7, so that is what I am going to be using for these examples. Let’s go File->New Project and select Visual C# -> Silverlight for Windows Phone -> Windows Phone Application. Set your Location and Name (I’ve chosen Simple Windows Phone 7) and then click “OK”. 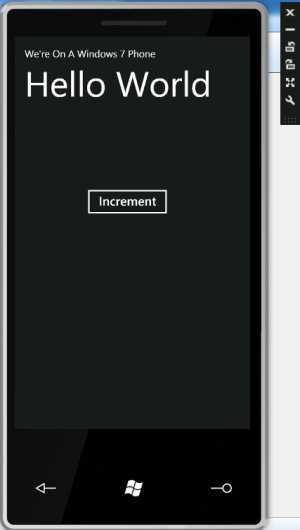 If you start with the MainPage.xaml, you can design the page’s UI. At this point, we are just doing some simple Silverlight stuff, so here is the XAML for the UI. Basically, we have a layout grid that is going to be as tall as the space that we have. Within that grid is another grid which is placed in the first row of the parent. The line <Grid x:Name=”TitleGrid” Grid.Row=”0″> defines that. Within that TitleGrid, we have two textblocks that have two different styles (both of which are built in). In the second row of the parent grid, we have another grid defined by <Grid x:Name=”ContentGrid” Grid.Row=”1″>. Within that grid is a TextBlock (kind of like a Label in WinForms or WebForms) and a Button. The button has a Click Event defined as Click=”Incrementer_Click”. We can jump now to the code behind in MainPage.xaml.cs. If you have done WinForms, WebForms, or (obviously) Silverlight before, this will be very comfortable to you. // This stuff was given to us for free when the file was created. // This method, I added. // We increment the counter, and then display it in a very familiar way. That’s all there is to it. If you hit F6 you can build the app and F5 will deploy it to the Windows Phone 7 emulator and launch your application. You may notice that this takes a very long time the first time that you do this. That is because the software really is emulating the hardware and that emulator is running a full version of the actual Windows Phone 7 OS. It is booting up and getting deployed to exactly as if you had started with a phone, turned it on and plugged it in, deployed to it, and launched your application. 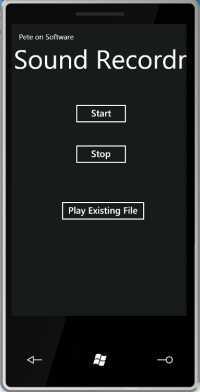 To bypass that long delay, you can leave the emulator running between builds as you would your regular phone and just deploy and test to it over and over again. Here is the application after the deploy and launch. Because of the “for free” code we got which declared that our application will run in Portrait or Landscape, if I turn the phone sideways you can see that things do turn and display in landscape mode for us. And here is what we see if I click the button at the bottom of the phone and navigate back to the main menu. As you can see, getting started with apps on the Windows Phone 7 is not very difficult and in my next Windows Phone 7 entry, we will dig a little deeper into what the SDK has to offer us.